Taking Ford (NYSE:F) shares for more than a quick test drive over the past few years has been a less than an enjoyable ride. Now increasingly bearish conditions off and on the price chart point to a well-defined opportunity to ride Ford stock to big profits by shorting shares. Let me explain. The last several years have seen a historic bull run in the Dow and other averages. It’s also made Ford stock look more like a broken, old clunker, especially compared to the likes of disruptive automotive peer Tesla (NASDAQ:TSLA) and longtime rival General Motors (NYSE:GM). The fact is the broader market and GM stock have more than doubled in price since late 2011. That period is when equities last made bulls worry that the financial crisis might not be over. Meanwhile, TSLA shares have soared by a meteoric 1,200% to 1,300% over this period. Being generous in our calculations, shares of F are down about 20%. Ford bulls might point to the company’s dividends during this stretch. However, we’re also keeping the math apples-to-apples for the Dow and GM. And Tesla? I think most of us would be more than happy to have TSLA’s past price performance in our portfolios over counting on Ford’s dividend checks for our returns. Now, in the midst of a broader market correction, a worsening business environment that needs no introduction, and an in-trouble, canary-like Ford stock dividend of around 7.5%, Ford stock is also looking technically beyond repair and in position for shorting. There was a time not so long ago when the case could be made to go long or hold F shares. As recent as last fall, Ford stock did stage a nice-looking breakout above a longer-term dating back to 2014. But the bullish price action proved fleeting. More recently and at much lower prices, Ford may have offered another reason for technical-oriented traders a reason to go long; albeit at odds with what F’s ‘at-risk’ dividend was warning. As the monthly chart shows, an October monthly hammer which tested 2015’s mini flash crash low was confirmed during November. Unfortunately, over this past week ‘ho-ho-hope’ on the Ford stock chart turned into very real technical despair. With F breaking below pattern support shares are now prone to continued downside pressure. 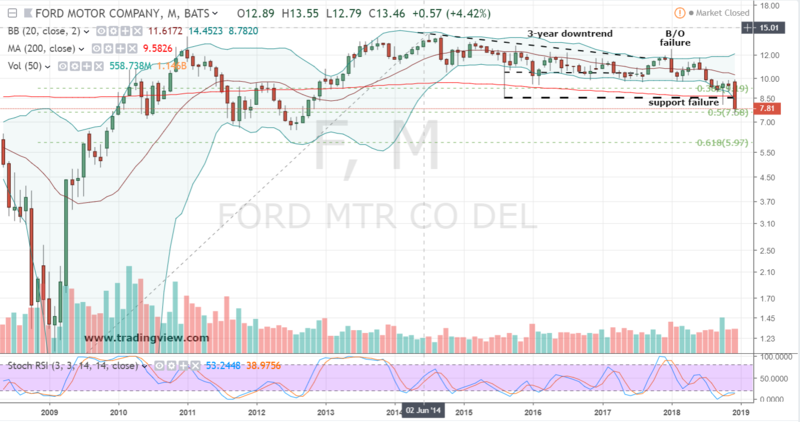 I suspect a cut to the dividend — which could happen before or following late January’s earnings report — would swiftly knock Ford stock down to a test of the 2012 bottom and then continue without much hesitation to a test of the 62% retracement level from the 2009 low. A decline in Ford stock of this magnitude amounts to a drop in share price of around 35%. That’s a lot to be sure. But given today’s less-healthy investing climate it’s also increasingly likely that won’t be the worst of it for F shares in 2019. For traders that agree Ford stock looks poised for aggressively lower prices, shorting shares at current levels makes sense. Bottom or squiggly price line, technical support has just been broken and F doesn’t appear so oversold as to warrant waiting for a pullback entry. For risk management I’d keep a stop-loss to 80 cents or roughly 10% of F shares. This keeps potential losses small while allowing for a decent risk-to-reward ratio. This stop also has the added technical benefit of exiting the position if Ford stock reverses back above the 2015 low — and sufficient evidence in our estimation to close any bearish shorts. 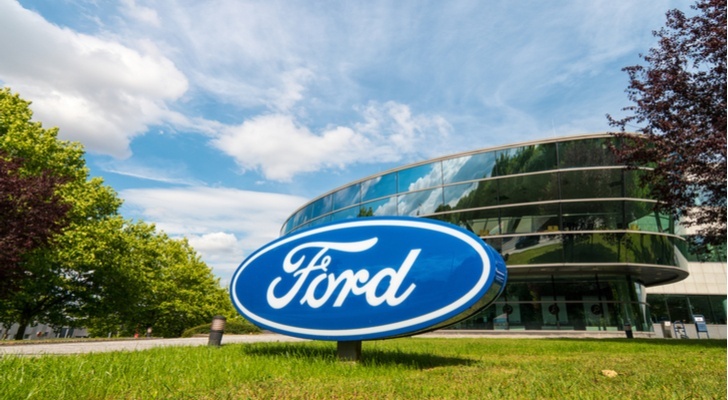 Article printed from InvestorPlace Media, https://investorplace.com/2018/12/ride-ford-stock-to-big-profits-as-a-bear/.